(Nanowerk News) Using ultrashort laser pulses an international team at Ludwig-Maximilians-Universitaet (LMU) in Munich and the Max Planck Institute of Quantum Optics has managed to manipulate the positions of atoms in hydrocarbon molecules in a targeted fashion. Researchers in the Departments of Physics and Chemistry at LMU Munich and the Max Planck Institute of Quantum Optics (MPQ) have used light to reconfigure hydrocarbons. 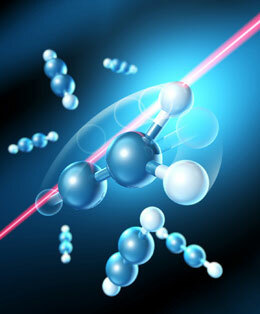 By applying ultrashort laser pulses they removed an outer hydrogen atom from one side of a hydrocarbon molecule and directed it to the opposite side, where it reattached (Physical Review Letters, "Steering Proton Migration in Hydrocarbons Using Intense Few-Cycle Laser Fields"). The method could in future be employed to synthesize new substances by controlling individual steps in chemical reactions. The experimental observations and their underlying mechanisms were elucidated by quantum-mechanical simulations performed in Professor Regina de Vivie-Riedle's group at the Department of Chemistry at LMU. Using laser pulses lasting only a few femtoseconds, a team of physicists led by Professor Matthias Kling, the leader of the Ultrafast Nanophotonics group at the Department of Physics at LMU, modulated the vibrations of acetylene molecules in such a way that they could selectively remove a particular hydrogen atom from either the left or right side of the molecule. The hydrogen atom then spontaneously migrated across the molecule to the other side, resulting in the formation and release of the chemical vinylidene. The researchers have also used the technique to reconfigure allene, a larger molecule belonging to the same group of hydrocarbons as acetylene. In doing so, they demonstrated that their method also worked for hydrocarbons with longer chain lengths. Motions of electrons and atoms are fundamental to chemical processes in nature. By exploiting laser technology, researchers are developing ways to influence these motions. "Our experiments have shown that we are not only able to direct electrons in the microcosm, but also hydrogen atoms, which are about 2000 times heavier", says Matthias Kling. "In both cases it is the wave nature of the controlled particles that is responsible for the underlying mechanism", as Regina de Vivie-Riedle explains. In their experiments, the researchers have thus reconfigured matter with the aid of light. "We hope that we will be able to take apart various kinds of substances in the future and put them back together at will", says Kling. Such a light-driven mode of chemical synthesis could help to fabricate new substances in the future. This prospect is particularly appealing in the fields of medicine and drug design.